← False bravery, random curls and youtube bingeing..
Just a quick post about my Ponytail!!! I dont really know what to say about my hair..I have purposely avoided it for a month. Today however, I treated it with tender love and care..I have made up my mind (for now) No more heat until 2013. ..I washed it in the shower today with the Shea Butter Shampoo that I never used and then I combed it out with my Giovanni leave in conditioner. I decided not to leave it in because I have learned that it does not play well with other products and leaves little white balls in my hair! After that I used some of the Shea Moisture Style milk and copmbed it through..man that stuff smells good! I am happy with my length, I was actually able to put my hair in a ponytail!!! I am totally excited. Since its growing at the rate it is, I am starting to think of other styles that I maybe able to wear it in. I no longer have a TWA LADIES!!! YAY!!! Here is a pic of my ponytail. 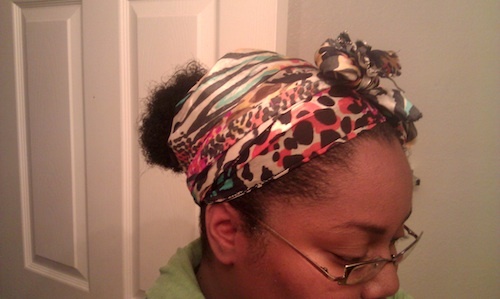 I used some eco styler gel to lay down the edges, then I tied it down with a silk scarf. I think I am going to through on some large hoops and rock this style to church tonight! What do you ladies think? Do you have any style suggestions?